and death matter for BAE Systems’s armored-vehicle complex in West Chester, OH, says Dan Sizemore, plant manager of the facility that fabricates up-armor kits for military Humvee vehicles. 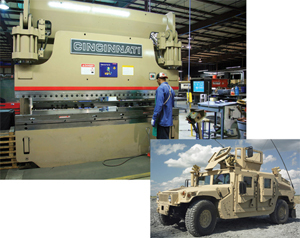 The plant operates 24/7 churning out underbody armor components to increase Humvee protection against land mines and other explosive devices. Conflicts in Iraq and Afghanistan have demanded tremendous boosts in production volumes, according to BAE plant manager Dan Sizemore: Output of truck-armor sets has doubled, from 40 to 80 sets per day, over the past two years. Precision servo hydraulics on a highly rigid, heavyweight platform allow the Proform brakes to hold ram repeatability to ±0.001 in. Each of four fabricating cells in the plant boasts a pair of press brakes. Between the cells, BAE installed six 90-ton Proform press brakes and two 350-ton brakes to handle its mix of part sizes. Each cell bends seven underbody armor parts—four on one press brake, three on the other. “Standardized press sets and dedicated setups for each cell allow us to drive downtime and maximize throughput,” Sizemore says.